Web cloud backup and file-sync seems more popular today, Google launches Google Drive, some new services also come out recently. Cubby is one of them, it offers 5GB free web cloud space, sync and share your files between web space and computers. This new service is developed by Logmein which it is a well-known IT company. 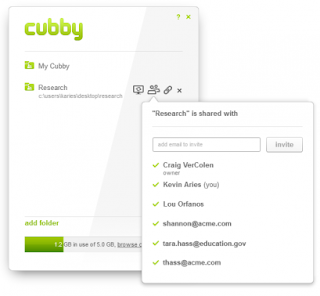 With Cubby, you can sync any directory between multiple computers, web cloud. It also supports iPhone and Adroid phones. Two ways you can use, one is to use a client that syncs your files between computer and web cloud, you don't have to worry anything, just put files in that folder. Another way is, only use web upload, just like regular upload files to server. It also syncs files to your computer, it means you can use other computer upload file on website that will be appeared on your own computer if sync function turn on. Cubby is still in beta now, it needed invitation to join, you can put email address in waiting list now.